The following General Terms and Conditions regulate the legal relationships between Bluray-Pornoshop.com and customers who order goods through the Internet online shop. The Terms and Conditions of Bluray-Pornoshop.com as well as, limited to the relevant scope of validity, the special and additional terms and conditions agreed to be integrated in the contractual relationship with the Orderer shall apply exclusively. The terms and conditions valid at the time of conclusion of contract shall be decisive for integration in the relevant contract. Any terms and conditions by the Orderer deviating from these shall not be valid. Consumers within the meaning of the following regulations shall be natural persons who conclude a legal transaction for a purpose that cannot be attributed to their commercial or independent occupation. 2.2 The list prices valid on the date of the order shall be binding for price quotation. All prices are quoted inclusive of VAT and exclusive of shipping costs. Bluray-Pornoshop.com reserves the right to make price adjustments. 2.3 The details on our website merely represent product and price information. After verification of your basket, entry of your personal details, selection of the shipping and payment method, you shall submit a binding offer to the Vendor (Bluray-Pornoshop.com) by clicking on the "Buy" button. 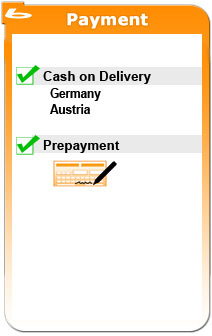 Our shop system shall confirm the receipt of your order automatically. However, this shall not result in a conclusion of contract. The contract shall not be concluded until the goods are shipped or a separate e-mail is sent, in which the processing or shipment of your ordered goods is confirmed. In the case of a valid cancellation, both parties are obliged to refund any performances received and to refund any emoluments taken (e.g. interests). In the case the performance received is returned only partly or in a deteriorated condition, the costumer might be obliged to pay value compensation. In the case that the deterioration is the result of a simple examination of the item - as it would for instance take place in a retail store - the aforesaid should not apply. Apart from this, the customer can prevent the obligation of payment of compensation by using the goods in accordance with the intended use and by treating the goods like his/her possession and by doing nothing deteriorating its value.Goods capable to be shipped as a parcel shall be returned at our risk. The regular costs for the return shipping is borne by the customer in the case that the goods delivered correspond to the goods ordered and the price of the goods to be returned does not exceed an amount of 40 euro. The same applies in the case that the customer has not yet accomplished the counter performance or a part payment contractually agreed upon in the case of a higher amount. Otherwise, the return shipping is free of charge.Items not capable to be shipped as a parcel shall be collected at the customer. Obligations of reimbursement of payments shall be performed within 30 days. This deadline begins for the customer with the dispatching of the declaration of cancellation or the item itself. For us, the deadline begins with the customer's receipt of the same. 8.2 Bluray-Pornoshop.com shall accept defect liability for a period of two years; the limitation period for these defects shall commence as of the delivery of the goods. Warranty claims shall be limited primarily to the remediation of defects in the form of a replacement of the goods. In the case that a remediation of defects fails, the Orderer shall be able to choose between a reduction of the purchase price and a cancellation of the purchase contract. Small customary and technically unavoidable deviations in quality as well as defects caused by improper treatment shall not constitute any claims for damages. 8.3 Bluray-Pornoshop.com shall not accept any guarantee for marketability or suitability of the goods offered for a specific purpose. Bluray-Pornoshop.com is obliged to handle the Orderer's personal details with strictest confidentiality in accordance with the Data Protection Act. These Terms and Conditions as well as the entire legal relationship between Bluray-Pornoshop.com and the Orderer shall be governed by English law to the exclusion of the UN Convention on the Sale of Goods (CISG). The place of fulfilment for all services resulting from the business relationships with the Vendor and the venue shall be the seat of the Vendor. Any side agreements or amendments on conclusion of the contract must be made in writing.